attached to one end. Available in various thicknesses, LX8 being the thinnest, LX20 the thickest. Generally used for Paraffin Wax candles. Always test burn with each new wax batch. Our choice for Soy & Beeswax Tealights, Votives, and Containers. Flat braid with thin paper filaments intertwined. Self-trimming, controlled curling, & hotter flame. Always test burn with each new wax batch. Round cotton core wick with tension threads to give it a slight curl while burning and a centered burn pool. Directional capillary action provides a more constant rate of fuel flow. Always test burn with each new wax batch. Wax candles. Always test burn with each new wax batch. Our choice for Beeswax & Soy Tealights, Votives, and Containers. 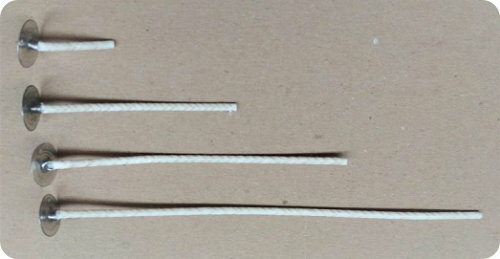 Flat braid with thin paper filaments intertwined. Self-trimming, controlled curling, & hotter flame. Always test burn with each new wax batch. Round cotton core wick with tension threads to give it a slight curl while burning and a centered burn pool. Directional capillary action provides a more constant rate of fuel flow. Effective in containers & pillars, and works well with viscous waxes such as Soy and Vegetable waxes. Always test burn with each new wax batch.